Business Digital Voice provides an interface to manage the customer inbound and outbound calling plans for each site and specific user/phone numbers. International. Note: you must add an International plan to your Verizon account before you will be able to make international calls. Please call 1-800-Verizon to add international dialing. The following topics will help you with common Calling Plans related questions. How do I modify the Outbound calling plans for all numbers in my business? How do I modify Outbound calling plans for Users? A. How do I modify the Outbound calling plans for all numbers in my business? Go to the Set/Change Call Policy for Site quick link. Allow – Calls of this type are permitted. Authorization Code Required– Calls of this type require an authorization code to be entered by the user before it will be permitted. Authorization codes must be added to the section below which define the allowed codes. Block – This type of call will not be allowed and will receive an announcement. Transfer to 1st – Calls to any number will be transferred to the Transfer Number 1 defined in the Transfer Number section below. Transfer to 2nd – Calls to any number will be transferred to the Transfer Number 2 defined in the Transfer Number section below. Transfer to 3rd – Calls to any number will be transferred to the Transfer Number 3 defined in the Transfer Number section below. Choose if the specific call types are allowed to be Transferred or Forwarded to another number by clicking the checkbox Transfer/Forwards. If enabled, users are able to transfer or forward the call type to another number. If calls attempted to a specific destination type are to be transferred, the numbers must be specified. Under Transfer Number, enter the transfer to number in the appropriate 1, 2, 3 fields. 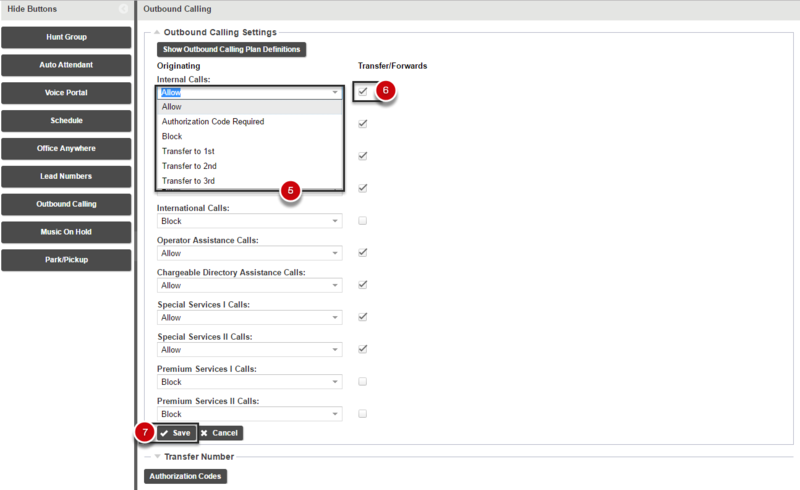 If an outbound calling rule utilizes Authorization codes, the codes need to be defined. Codes must be numeric and between 2 and 14 digits long. Once established, you will need to share the appropriate Authorization Codes with the User(s). Click on the Authorization Codes button. Click Add to enter a new code. Enter a name for the code in the Description field number and enter a number in the Code field. B. 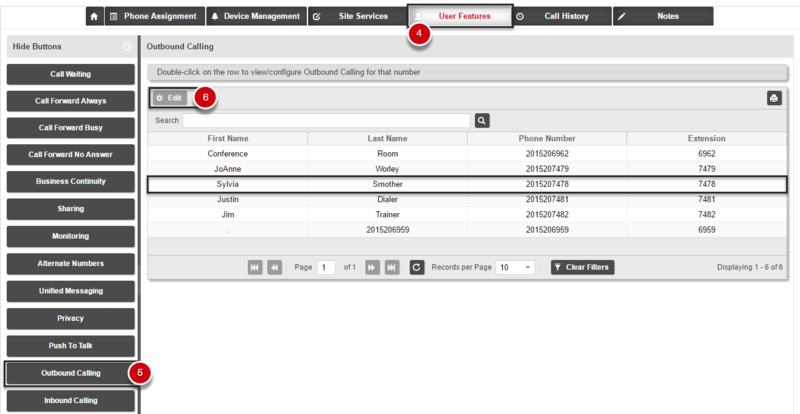 How do I modify Outbound calling plans for Users? Then select the Outbound Calling button. Select the User to modify and click Edit. Check Use Custom Setting to override the default settings set for the User. Click Save to save your changes. If calls attempted to a specific destination type are to be transferred, the numbers must be specified.